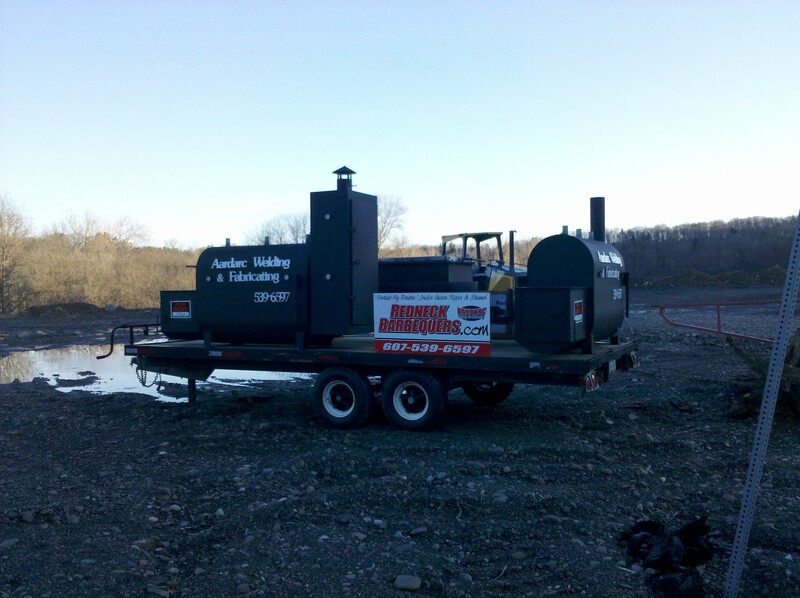 The Varna Community Center will serve a Roast Beef Dinner on Saturday, April 2nd from 4-7PM. The menu includes generous and tasty portions of Roast Beef, Tossed Salad, Baked Potato with sour cream or Mashed Potatoes with gravy, Harvard Beets, Green Beans, Roll with Butter, Dessert, and Beverage. All for $10.00. Call ahead for reservations (280-9750) and receive a $1 discount. The Varna Community Center is located at 943 Dryden Road, Route 366, in the heart of Varna. This morning's Ithaca Journal tells the story of Chris Muka and Common Land, Inc., mostly from their perspective. When we read the announcement for Common Land's auction, Angelika thought it was mostly an opportunity to pay taxes on the land so that Muka could continue to enjoy it, and I didn't think it could sell easily on those terms. It sounds like 1 of 23 parcels sold, so I don't feel too wrong about that. Apparently the county agrees enough on the tax issue to argue that Muka still needs to pay some taxes on the one parcel that did sell. this [Certificate of Occupancy] will be very unique. It will be one of the most unique I've ever signed because there is no requirement for electricity, no requirement for indoor plumbing, all of which are not required by New York State Code on single family homes. So, somebody looking at this is going to know right up front that they don't have electricity. 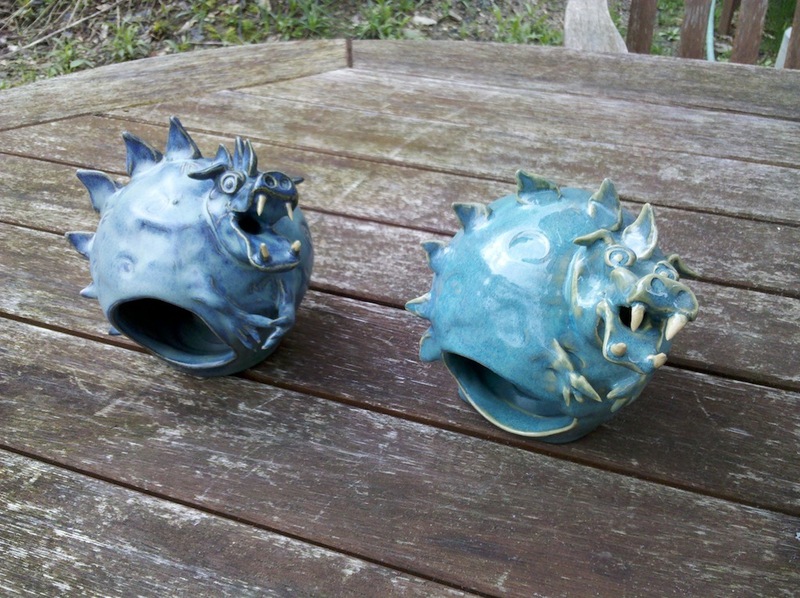 They do have a septic, but they have a privy. But it's all to Code standards. The teepees are nice, though. They don't really need electricity, I guess. In other Dryden news, the Guthrie Clinic office on Royal Road evacuated for a few hours after a strange smell, and the Tompkins County economy seemed to do a little better in February. Update: Here's the result of my FOIL request, as a set of PDF files. This one seems to be the key plan (3.4MB PDF), with more details here (1.7MB PDF). Volcanos rise and fall, and often make their neighbors unhappy. This also seems to be true for the pile of fill often called "Mount Varna", the eyesore for years that the Town ordered removed in 2009, finally declining to a mostly flat lot in April. 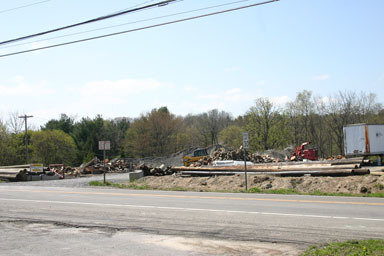 On the northest corner of the intersection of Route 366 with Freese and Mount Pleasant Roads, this two-acre lot is extremely visible, famously "even uglier than what's across the street from it", and adds to the challenges drivers face getting through an already complicated intersection. Mount Varna in October 2009. It's hard to tell in that last picture, but there's fresh work and new fill coming in. It's not a new mountain, and the new material seems to be getting built into the expanding plateau of fill. The new work, the existing zoning welcoming dense development there, the location, the generally unpleasant history of the spot, and the Town's unwillingness to pass an actual moratorium has neighbors - myself included - concerned about what's going on here. Is Nick Bellisario trying to build something - potentially even something pretty large - in advance of the Varna Master Plan even getting started? Does Varna really need new construction to demonstrate why pausing for that Master Plan would have been useful? Will the Town Board actually pass a moratorium if this is new construction? The Town won't say, so I've filed a Freedom of Information Law (FOIL) request. I'll post results here. Here's hoping it's just fill with no purpose yet set. Every now and then I pause to reflect that the highway in front of my house has been there, in one form or another, for centuries, perhaps millenia. 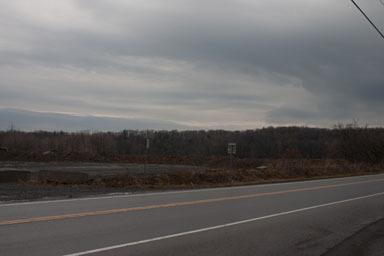 It was a path connecting Cayuga and Onondaga territory before it was expanded to become the Bridle Road, and then Dryden Road, and then Routes 9 and 13 for a while before becoming its current Route 366. Road signs may not be as excited as the old railroad logos, but we'd be wise to remember their stories. After three decades or so of wanting one, I've finally planted a weather station in my back yard. I don't have to be the only person to see its data, though - you can get information overload from the current data, updating by the minute. It's using wview to collect and process the data. It's not precisely attractive right now, and definitely not perfect - I need to level it for the rain collection to be accurate, and the rain data that's there is further screwed up by snow we had blocking it. The wind data is a little different because the anemometer is only five feet off the ground, but that's where it needs to be for us to calculate evapotranspiration. Still, it may be fun to look at. First it was the teepee, and now this. Mount Varna mailbox from the east. Mount Varna mailbox from the north. 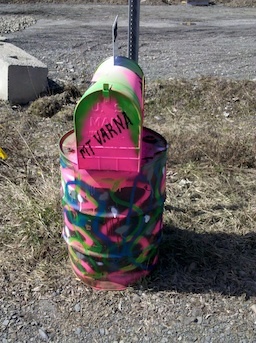 Mount Varna mailbox from the west. I noted recent activity at Mount Varna, and put in a Freedom of Information Law request to find out more. I got back a large set of PDF files about the property's past and present. This one seems to be the key plan (3.4MB PDF), with more details here (1.7MB PDF). The proposed 20-townhouse project in those is called the "Monkey Run Townhouse Project", which struck me as odd given that Monkey Run Road is about a half mile away. When I saw this, I wondered if it was some kind of weird protest. Now that I've realized that "SWPPP" likely stands for Stormwater Pollution Prevention Plan, I'm wondering if the developer's decided to show a sense of humor about the way the neighborhood's taken the handling of the property. Amount of CO2 the atmosphere can hold over time and still support a habitable planet for humans: 350 parts per million. HOW IS THIS POSSIBLE !!??? I'm too busy; I don't have time. I'm overwhelmed; it's too complicated. My wife / husband doesn't believe in climate change. None of my neighbors are doing it. Maybe the planet would be better off without people anyway. Your neighbors actually ARE doing it. Come to the Cafe on Tuesday. Eat Good Soup (homemade). Talk Smart. Leave Excited. Tuesday April 12th 6:30-8:00 at the Dryden Community Center Cafe. In 2011 we commemorate the 150th anniversary of the beginning of the U.S. Civil War. Tales of famous battles and heroic efforts will be retold and reanalyzed. Unfamiliar stories will also come to light including the role women played on both sides of the battle lines. On Thursday, April 14th, Carol Kammen, will address this unheralded service in "No Place for a Woman: Civil War Nurses from Tompkins County." Ms. Kammen is the Tompkins County Historian who writes a weekly column for the Ithaca Journal and has published several books on local history. Join the Dryden Town Historical Society at 7 PM in the Dryden Village Hall (at the corner of South and George Streets) to learn more about the invaluable contributions made by local women in caring for the wounded and the dying during the tragic years of the Civil War. The doors will open at 6:30 PM and, as always, this event is free and open to all. I'm way behind in keeping up with the Ithaca Journal, and need to post these links before the articles vanish into the archives, so apologies for the not-lovely presentation. Want to run for school board? Deadline approaching. Could regional development councils work? Every now and then a comment meant to dismiss an idea leads to something much more interesting. Americans hate two things: they hate sprawl, and they hate density. And then he laughed along with much of the board and the audience, because those two things are supposed to be opposites. In theory, this explains why zoning conversations are so difficult. This morning, though, I realized that he'd summed up the fundamental reasons for my opposition to the proposed zoning changes. While many of the changes do simply rationalize the weirdly chaotic zoning we have now, the overall direction is targeted at creating denser sprawl: too dense to give residents a sense of privacy, too sprawling to create a critical mass that creates advantages more important than the loss of privacy. It's a unique combination of those two supposed opposites, both of which, I agree, Americans generally dislike. When I first saw the day-glo mailbox at 366 and Freese Road, I thought I was hallucinating. As it's stayed there, however, it's become clear that despite the colors, it's not a hallucination, but more a case of wearing a scarlet letter proudly. Boldly announcing itself as "Mount Varna", residents' harsh term for the pile, it reminds everyone who knows the story that there's been ugliness here for a long time. And the cryptic SWPPP on the top adds a touch of mystery, that might lead someone (who can get past the big "US Mail" on the front of the box) to open it. I'm hard-pressed to come up with a more brilliant joke on the Town and Varna residents than this. Forced by the Town to do something, put up a vibrant protest that's nearly impossible to miss, while pretending that it's actually there because the Town wants it. Then leave out the substance, the reason that the whole thing is supposed to be there. Hopefully they'll take a more constructive approach to the remediation work itself than to the notification. Unfortunately, even brilliant mockery isn't always funny. The message of this joke seems to be "hey look at me, I can do whatever I want! ", and that's not exactly a great foundation for a long-term conversation. Lately, I've mostly worried about threats to Dryden that come with large wallets and bad ideas, but some problems have humbler origins. This morning's Ithaca Journal reports that feral hogs are moving into the area, and "breeding in three New York counties -- Tioga, Cortland and Onondaga." adopted a take-no-prisoners approach to their management. The DEC is giving hunters and others almost blanket approval to kill the wild pigs on the spot. The more expensive walk-in traps also sound promising. I'm definitely going to have to consider some extra reinforcement for my deer fence, both to protect from digging and to discourage huge hogs from pushing right through. It's also another good reason to get a game cam out there, so I can see what's coming through. On a very different note, I'm pretty sure I saw these folks walking up 366 yesterday afternoon on their protest march to Syracuse. There's also an article on the back and forth on the hydrofracking debate. Somehow it doesn't notice the David and Goliath nature of the funding on the two sides of the battle. The Park Foundation may be environmentally minded, but it's a tiny pile of money that doesn't stand to make more money based on its efforts. Tompkins Weekly's previous issue (4.8MB PDF) had a couple of articles on happenings outside of Dryden that seemed relevant here. Many in the audience expressed a fear that Jacksonville has several older homes that are prime targets for absentee landlords. These landlords often purchase single-family homes, obtain zoning variances to turn them into multi-family dwellings and then neglect to maintain the properties or adequately or manage their tenants, residents said. I wish them luck - that cycle of decay makes it very difficult even to maintain a neighborhood's respect even among residents of the same town. Pushing back against landlords whose primary interest is extracting cash without much interest in their properties is a difficult challenge. Lampman agrees that speeds may increase once the pavement is replaced, but he says the county is initiating plans to enforce speed limits on Hanshaw and other roads where speeding is an issue. The county intends to preserve or replace landscaping to maintain the existing perception of road width, he adds. Crosswalks will be added at intersections west of Warren Road. I look at the County's ever-shrinking budget, and I wonder how anyone can promise that there will be enforcement to prevent speeding that's built into the design of the road. Some enforcement? Probably. Enough enforcement to make drivers consistently drive at the posted speed instead of the design speed? Hard to imagine. It seems like half the point of protesting these days is disputing which side had more people there. Yesterday saw a "Tax Day" protest in downtown Ithaca outside of Congressman Maurice Hinchey's office, organized by Forward Thinking, the Ithaca Tea Party, while Democrats held a counter-protest across the street in front of the library. The Ithaca Journal reports 25 Tea Party protesters and 85 or 90 counter-protesters, though they note that some of the counter-protesters joined after a rally about taxing Bank of America. Visit One of Nine's brief article, though, and you get a very different set of pictures. Five counter-protesters (two from Dryden), and about eighteen Tea Party protesters. Going for a close-up sure can make the opposite side look smaller. If you prefer to get your weather through a comprehensive site like Weather Underground rather than a one-point site like mine, you can have the best of both worlds: my station is now on Weather Underground. The Weather Underground data updates less frequently - every half-hour - than my own little site, and has less data, but it's definitely more convenient for forecasts and radar. It still doesn't sound delightful, but the school budget story seems slightly less dire than before as the state restored some funding to districts. Dryden has four candidates up for three school board seats, while Ithaca schools are still accepting candidate petitions through April 27th. Finally, Murray Cohen of Dryden asks if it might be "a fine symbolic gesture if members of Congress voted to cut their salaries in half for the rest of this year and all of 2012?" The Town of Dryden website still refers to February and March meetings, but there is an April Town Board meeting tonight at 7:00pm at the Dryden Town Hall, 93 East Main Street (Route 392), Dryden. I expect it will be pretty full, as the Dryden Resource Awareness Coalition will be presenting their petition to ban hydrofracking in the Town. Tonight was an amazing meeting - over a hundred people showed up, and over twenty spoke. 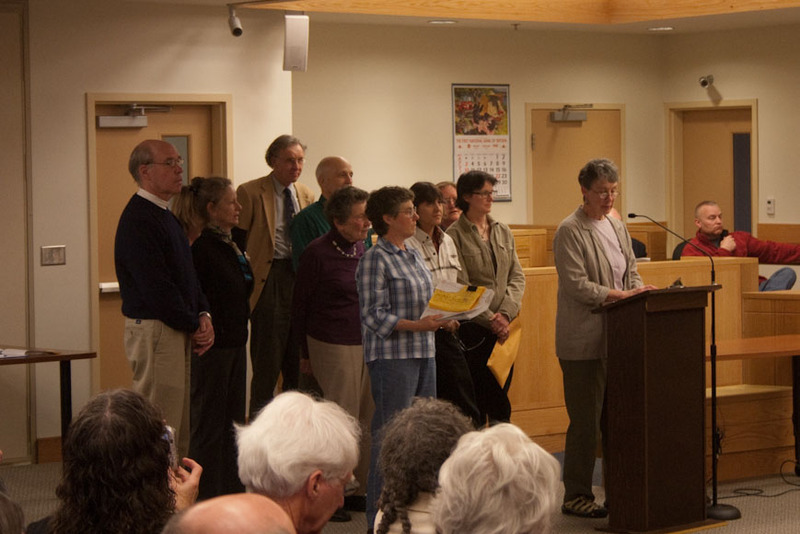 The Dryden Resource Awareness Coalition presented 1594 signatures on their petition to ban hydrofracking in the Town. The Town passed a resolution calling for work toward a local law that would accomplish that through zoning. The Town also passed a Sound Performance Standards law, and didn't quite introduce a proposal for a moratorium on development in the area being studied for the Varna Master Plan. I would like to congratulate the board on its generally excellent handling of day-to-day administration and running a government, as well as on its recent steps toward vastly improving broadband availability across the Town. Unfortunately, while the Town does an excellent job on projects that maintain or improve life in the Town of Dryden, it also often fails at defending against threats that could make such improvements irrelevant. Powerful forces with unfortunate ideas keep showing up and threatening to change Dryden for the worse. The Board's response to these proposals over the past few years has frequently been tepid, and even at its strongest, delayed. The Board seems continually to hope for the best, naively dreaming that accomodating these powerful people and industries with dire reputations, perhaps trimming around the edges of their bad ideas, will somehow make things better. Meanwhile, residents and neighborhoods know that they take the loss if things go wrong. Please take clear and decisive action to keep the worst from happening while you research long-term solutions. Please stop forgetting about the damage these players have already wrought in their past endeavors. Please demonstrate to residents that the Town is on their side, not the side of whoever comes to town with dreams of making piles of money here. Moving slowly on complex issues like Varna development and hydrofracking may seem like a prudent option, but delays are gambling with our futures. We may not live in a storybook paradise, but Dryden is worth defending. This land, these people, are worth defending. Update: It's not me (phew!) but there's even a bit of video already available of tonight's meeting. 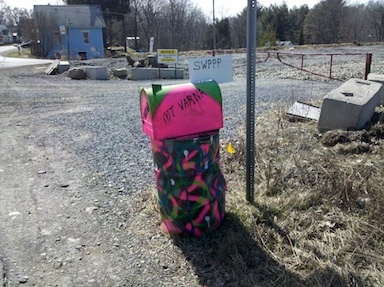 The Dryden Town Board passed two things last night: a sound performance standards amendment to zoning, and a resolution about drafting an amendment that "addresses land uses that would impose or threaten to impose significant adverse impacts upon the Dryden community, including without limitation heavy truck traffic, noise, air, and water pollution, and the generation of a significant amount of wastes". The sound performance standards (available here (72KB PDF)) have been moving through for a while, though Town Supervisor Mary Ann Sumner made clear that this isn't the end of the process for these. There is more work to be done, particularly on subsonic noise. Passing the standards was a bit confused. There was a public hearing at the beginning of the meeting with no comment, and the board passed them at the end. Then the board had to rescind that passage. They'd thought that no State Environmental Quality Review (SEQR) was needed, but it was. They then worked through the SEQR and passed the amendment 5-0. Motion by Cl Leifer, Councilperson to adopt the following resolution. WHEREAS, the Town Board of the Town of Dryden is empowered under the New York State Constitution, the Municipal Home Law Rule, the Statute of Local Governments and the Town Law to adopt local laws for the protection, safety, health and well-being of persons and property within the Town, and to enact zoning regulations. RESOLVED, that the Town Board of the Town of Dryden directs the Attorney for the Town, Mr. Mahlon Perkins, to complete his review of the proposed zoning amendment banning heavy industrial methane gas drilling presented to Ulysses and previously forwarded to his attention by the Town Supervisor, and subsequently to review the draft of the local law prepared by Councilperson Leifer upon its completion, and to report to the Town Board on the legal sufficiency of the draft law prepared by Councilperson Leifer. You can see a some video of the passage of this resolution. DRAC announces the results of a petition drive to ban fracking, calls on the Dryden Town Board to pass a protective zoning ordinance; Town Board unanimously passes resolution to move forward with drafting an ordinance. On Wednesday April 20, 2011, the Dryden Resource Awareness Coalition (DRAC) announced the results of its town-wide public petition drive calling for a ban on high volume, slickwater hydrofracking for gas extraction in the Town of Dryden. The announcement, that 1,594 Dryden residents have signed the petition to date, took place during the monthly meeting of the Dryden Town Board, shortly after 7:00 pm at Dryden Town Hall, 93 East Main Street, Dryden NY 13053. 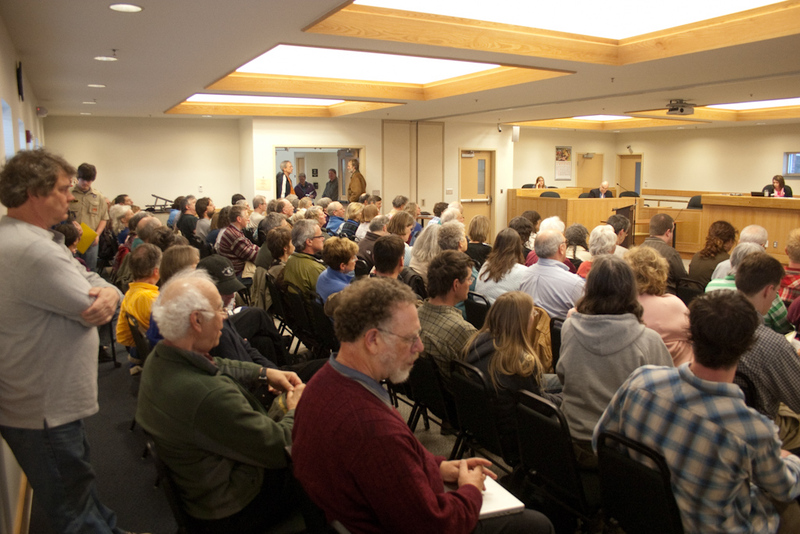 The hall was packed by over 100 people, the overwhelming majority of whom were there to show their support for a zoning ordinance that would ban the heavy industrial uses associated with high volume slickwater hydraulic fracturing (photo attached). As leader of the petition drive, Dryden resident and DRAC member Marie McCrae handed over the thick stack of signed petitions, and described the carefully coordinated signature collection process carried out over a 4-month period by 30 petitioners throughout the depths of winter. With the other core DRAC members standing behind her, McRae called on the Dryden Town Board to pass a zoning ordinance that would exclude high-impact industrial uses from the township. During the next hour, almost 30 people rose to speak for two minutes each on their concerns and the need for this ordinance. Long-time Dryden resident Buzz (Mitchell) Lavine said, "The federal and state governments cannot protect us. The power to do that is right here in this room." Lavine has lived in Tompkins County for 48 years, in Dryden for 39, and served on the Town of Dryden Planning Board for 20 years. One audience member warned of the possibility of a lawsuit against the town by a big gas company, to which attorney David Slottje rejoined that there is long legal history in New York State to back up a local town's legal right to zone out unwanted uses. Following the public's input, Dryden Town Board member Jason Leifer introduced a motion to approve a resolution directing him to draft an ordinance with input from town attorneys from Dryden and neighboring towns. Board member David Makar swiftly seconded the motion, and with little discussion the resolution was unanimously approved by Makar, Leifer, Board members Joe Solomon and Steve Stelick, and Dryden Town Supervisor Mary Ann Sumner. The room erupted in cheers, clapping and hoots, with more than one dignified middle-aged person jumping up and down and dancing around. The crowd quieted quickly to hear Supervisor Sumner's instructions to Leifer to commence the drafting process. She also told the audience to prepare for upcoming public hearings over the next one to two months prior to a final vote on a completed ordinance. At 9:10 pm the crowd slowly dispersed, leaving the Board to conduct the rest of the town's monthly business. 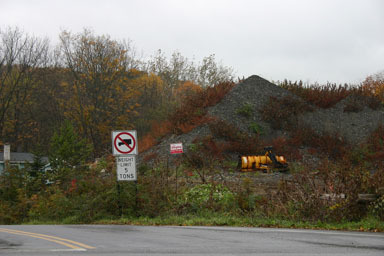 According to Helen and David Slottje, attorneys with the Community Defense Council Inc. who have developed zoning language for a proposed ordinance of this type, "Our recommendation to New York state municipalities seeking to preserve their character and avoid industrialization is to adopt a zoning law or amendment that specifically prohibits high-im¬pact industrial uses within the mu¬nicipality, and to utilize a definition of "high-impact industrial use" which encompasses unconventional gas drilling and any other uses deter¬mined to be inimical to the munici¬pality's desired character and goals." We, the undersigned residents of the Town of Dryden, believe that high volume, slickwater hydrofracking for gas extraction threatens our water and our air. Allowing this practice in our community will significantly endanger our health and well-being. Hydrofracking is a heavily industrialized process that in surrounding states has snarled traffic and caused significant air, water and noise pollution, and severe damage to roads and other infrastructure. In many places it has had deleterious effects on tourism, hunting, fishing, agriculture and the local economy in general. 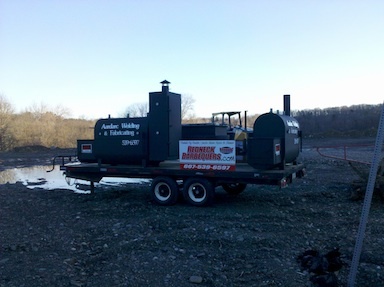 We urge the Town Board to ban slickwater hydrofracking in the Town of Dryden." The concerns expressed by DRAC and Dryden residents about protecting the future of their town are in line with Dryden's Comprehensive Plan, adopted in December 2005. The goals and objectives listed in the Plan include preserving the rural and small town character of the Town of Dryden and the quality of life its residents enjoy; promoting the long-term economic viability of the agricultural community in the town and preserving agricultural land resources; and preserving the natural open space resources, environmentally sensitive areas and unique flora and fauna of the town. These are long-established Dryden characteristics that would quickly wither under the onslaught of gas drilling activities. Also, the Comprehensive Plan's goals and objectives pertaining to housing and residential development, commercial development, economic development, parks and recreation, and public safety would be crippled by the advent of heavy industrial activities in Dryden. "Over 1500 Dryden residents are calling on the Dryden Town Board to stand up and be our heroes," say DRAC members Deborah and Joanne Cipolla-Dennis. "If fracking comes to Dryden, we won't have a choice - we'll have to leave. But we don't want to leave, so we are asking the Town Board to protect the Town that we all love so much by passing this zoning ordinance as soon as possible." Dryden residents are still encouraged to sign the petition, either online at http://petitiononline.com/nofrack or by contacting DRAC for a copy of the petition. The Town has updated its website with a new look, though my favorite feature is that I no longer have to open it and then do something else for a while waiting for it to load. There is, as always, lots of information there. Today's Ithaca Journal reports on Wednesday night's presentation of 1594 signatures on a petition to ban hydrofracking. There's also a piece on Dryden events discussing details of leasing and termination to be held April 28th and May 12th. Several of the speakers at Wednesday's Town Board meeting mentioned the Chesapeake well blowout in LeRoy, Pennsylvania. 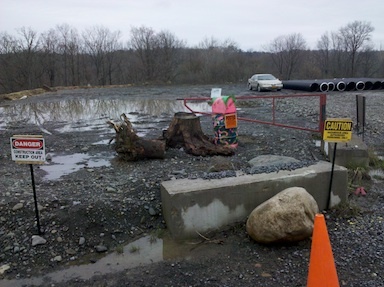 The Journal reports that Chesapeake has stopped the flow of liquids and claims there will be little impact on Towanda Creek, but has stopped fracking operations in Pennsylvania. In brighter news, the Cayuga Bird Club will be meeting at Dryden Lake this Saturday, April 23rd, at 7:30am "to enjoy early spring migration". WENY TV, one of the stations I watched a lot of growing up in Corning, leads with a report on the Dryden Resource Awareness Coalition's presentation of a petition to the Town Board. It's a 2-minute spot, well worth watching. I still need to write up an index to this, but I've posted the audio recording of last week's Town Board meeting from the presentation of the DRAC petition through the citizen's privilege discussion and the passage of the resolution in support of developing a local law. It's 74MB (and 1 hour, 13 minutes) long, and available in either QuickTime MOV or M4V format. This just gets funnier and funnier, though the joke's probably on me. I noticed that the Mount Varna technicolor mailbox had fallen over again, I guess from the winds on Saturday, and wondered what its next act would be. It's now stoutly defended by signs. 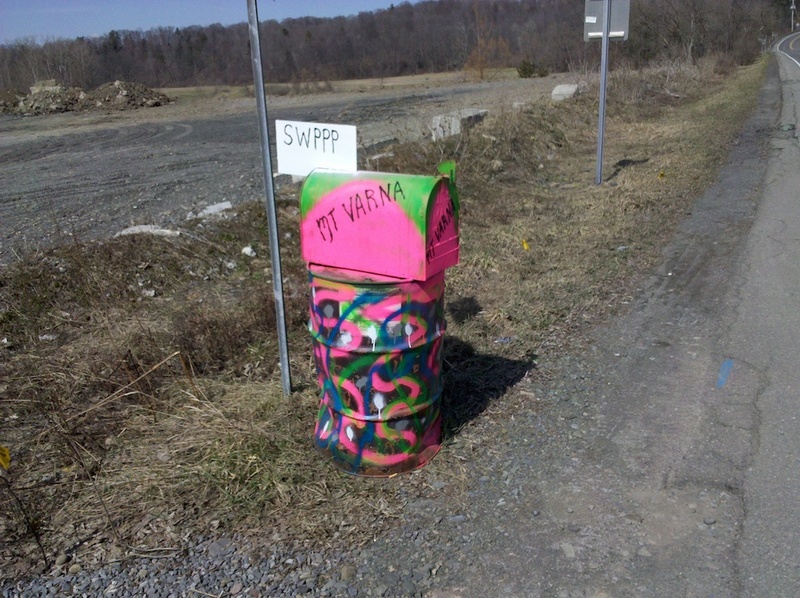 There's a POSTED sign right on the barrel, and it's behind CAUTION and DANGER signs for the site along Route 366. 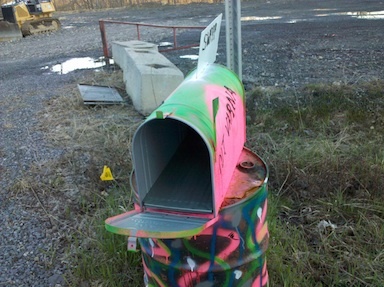 Stay away from the technicolor mailbox. Is there a Stormwater Pollution Prevention Plan in there, like there's supposed to be? I don't know - I didn't check. It felt like trespassing. Oh well. We've bought a fair number of plants at this sale, and always recommend it. Due to ongoing construction at Ithaca High School, this year's annual Spring Garden Fair and Plant Sale will be held at a NEW LOCATION -- the New York State Armory, 1765 Hanshaw Road (off Rt. 13) in Ithaca -- on Saturday, May 14 from 9:00 am to 1:00 pm. The Armory site includes ample and easily accessed parking, a large indoor room for gardening groups, and outdoor space for more than 40 growers and gardening groups that will participate this year. Admission is FREE and visitors are encouraged to bring carts or wagons to aid in transporting their plant purchases to their cars. The Spring Garden Fair & Plant Sale features a wide variety of vendors from our region who offer specialty plants and gardening advice on topics ranging from growing rock garden plants to selecting native species for the garden. Plants for sale include organically grown and heirloom vegetable transplants, colorful annuals, fragrant herbs, hanging baskets, small flowering shrubs, hardy roses, fruit crops, evergreens, and specialty perennials. Master Gardeners from CCE-Tompkins and other community groups participate in the Fair to raise funds through plant sales, and to create awareness of their programs. For more information, call Cornell Cooperative Extension of Tompkins County at (607) 272-2292 or email Monika Roth at mr55@cornell.edu. An up-to-date list of participating growers and groups is available online at http://ccetompkins.org/plantsale. There is an "Is this correct?" button on the map results that lets you send an email. The state also has a speed tester that they don't seem to have integrated with this, at least not yet. Please let me know if I've misspelled or mistaken any names, or botched a time. Crowd at April 20th Town Board meeting. Dryden Resource Awareness Coalition presents 1594 signatures supporting hydrofracking ban. I've posted a gallery of images from that discussion - sorry it doesn't include every speaker. I've always loved Etna potter Gary Rith's work, and when I saw this dragon, I couldn't resist. Angelika loves dragons, especially floppy-eared dragons, so I wrote Gary and asked if that was possible. Such happy, cheerful creatures - and they've made Angelika happy and cheerful too! I didn't even realize that carnivorous dragons were available. 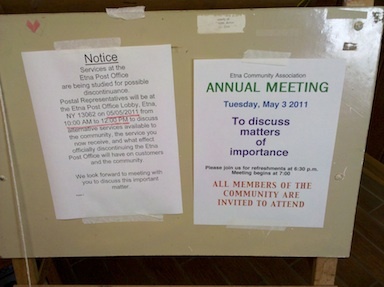 Etna post office "studied for possible discontinuance"
Notices in Etna Post Office. Services at the Etna Post Office are being studied for possible discontinuance. 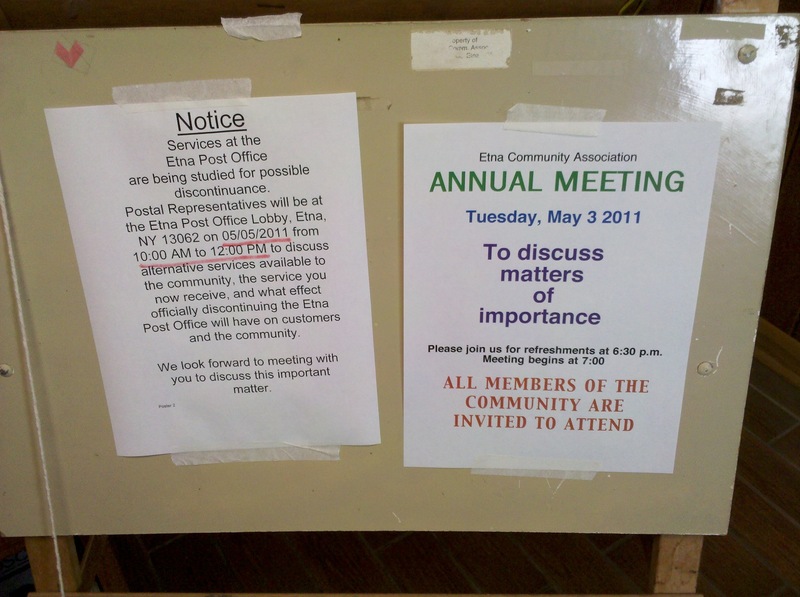 Postal Representatives will be at the Etna Post Office Lobby, Etna, NY 13062 on 05/05/2011 from 10:00 AM to 12:00 PM to discuss alternative services available to the community, the service you now receive, and what effect officially discontinuing the Etna Post Office will have on customers and the community. We look forward to meeting with you to discuss this important matter. The first paragraph is "studied for possible", but the second paragraph sounds like they've already concluded the study and are just saying what happens next. I guess we'll find out on the 5th.